Just finished it yesterday. I was unimpressed. Not the worst Star Wars book I have ever read, but I walked away feeling me. It was a typical story with no real surprises. I didn't care about any of the characters except the ex-Imperial Loyalty Officer and Mr. Bones. The interludes really didn't do much for me. More a distraction than actual information. All-in-all, meh. Overall I was disappointed. The book was billed as answering the questions or the "bridge" between RotJ and Ep VII. I feel as though I have really learned nothing new. I read it recently, and I found it to be rather boring and predictable. The writing style was not as bad as some Amazon reviewers made it sound (though still not very good). The only characters that were interesting, in my opinion, were Rae Sloane and Mr. Bones. Welcome to the Pit, Alfa! I have been extremely un-impressed with the first crop of novels to come out for the new timeline. I read Bloodline, and although it has a good idea behind it, I thought it a poor story with un-interesting characters. I finished the book but just barely. Then, I read Catalyst, which is the prequel to Rogue One, and I didn't like that book, either. It's better than Bloodline. I finished Catalyst. But, it was boring, too. It's a short piece of story stretched and dragged to the size of a novel. I attempted Aftermath, but I found it to be the worst book of the bunch and the only one that I could not finish. I read about half of it, and I could care less about the story. It provided precious few details, in what I read, about what happened between Return of the Jedi and The Force Awakens. Maybe I'll attempt it again sometime, but I've already made two attempts. Both times, I stopped reading the book. Seems like they’re just going for straight-up movie-tie-in merchandise. They’re not in the business of building up a whole other Expanded Universe. To be fair, I think Disney is being extremely tight fisted with any new material. They want to keep their newly swept (of Legends material) universe clean, and they want the books and comics to be canon. So, they're not allowing the writers to write anything but "safe" stories. No new events or ideas. For example, an author may have a fantastic idea to write a trilogy about how Emperor Palpatine survived his death at Endor, and Luke had to come in and finally kill him. They won't allow that. And, if an author had a great idea for filling out the background of Snoke. Nope, won't allow that, either. So, we're not ending up with very interesting stories. Though, I will say, that Marvel comics is doing a bang up job with their Star Wars stuff. The book publishers should take a note. I haven't read the new novels, but I'm actually ok with Disney not allowing other writers to draft a ream of stuff they're later gonna retcon. That was the problem with the old EU, and it annoyed me because dammit, spaarti cloning cylinders buried in a mountain were a lot cooler than Kaminoan Apple Stores. If your rule had been in place when the EU was being written, then you would never have experienced the spaarti cylinders in the first place--clearly a superior presentation of the idea. I just want to read/hear a good story. I really don't care if it is retconned later or doesn't fit in the timeline. Seems like they’re just going for straight-up movie-tie-in merchandise. It seems to me just the opposite. The canon novels are not very relevant to the films. The EU had some fantastic prequel tie-in novels by James Luceno that featured good use of film characters and tied directly into the films. Now they're pussyfooting around the films and it's boring. Whats funny is that I couldn't get into Aftermath and put my copy aside. Fifty pages in, and I still gotta say "nope". What did it is that the novel is written in present tense and it makes it really awkward. A friend of mine read all three in his trilogy and said Aftermath is weird and flawed but the other two are very good, considering. I noticed the present tense thing, and I think it was part of what made it difficult, definitely. So, I just learned something about this book. And, I learned it from the Poe Dameron comic, of all places. Snap Wexley is the kid in this book*. 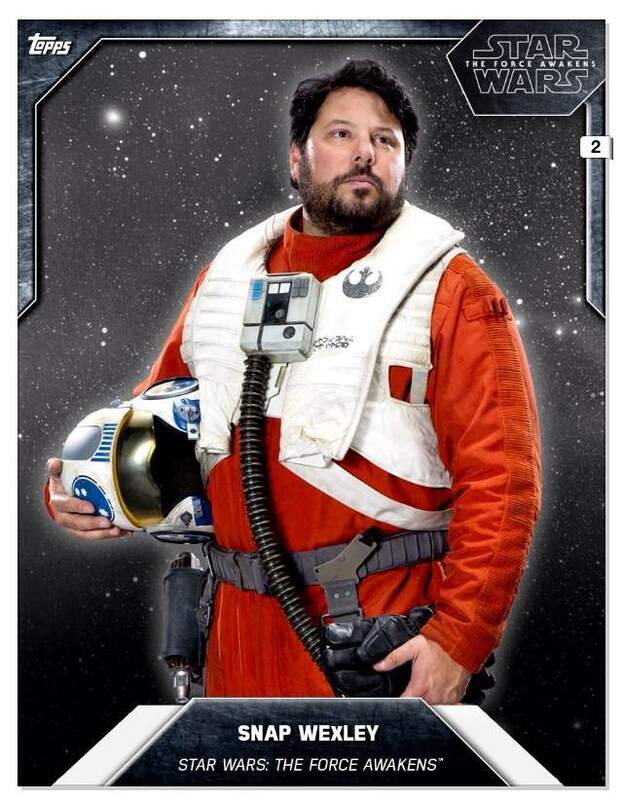 A member of Poe Dameron's Black Squadron. The first two times I attempted to read the book, I didn't know any of the new characters from the new films. This being Wexley's background as a kid, it makes the story slightly more interesting to me. I may give it another shot (a third or fourth attempt), just because I own the book. Maybe after I get through listening to Tarkin. *There's a scene in the Poe Dameron comic (where I realized that the kid in the book was Snap) where Snap sends Poe the personality matrix for Mr. Bones. If you haven't read Aftermath (and I've only read half), then you might not understand when, in the comic, Poe's droid go crazy, singing, killing everyone one in sight, saying that he is MR. BONES. I thought it a great scene. But, you've got to know the connection to understand the scene. From what I've read, Mr. Bones is the best idea in Windig's entire book. Given my re-tuned expectations, I may try Aftermath again. Hell, this time, I might even enjoy it. So, I'm listening to "Empire's End", and I get to "Interlude: Kashyyyk"... and for a mad second, I am half-convinced (based on nothing) that they are going to simply have five to ten minutes of wookie impersonations. I picked up a copy of Aftermath: Lifedebt by Chuck Wendig at my library. Wow was that awful. But the writing is just bad. Bland, boring, and choppy (seriously Chuck your a paid author, figure out how to use transitions every now and then) with some odd ("toodles") and or even just wrong word choices. I've done adventure write ups for our old Star Wars campaigns and I did a lot of write ups for a non-Star Wars campaign. The better adventure write ups are of about the same quality as Chuck's writing...and I don't have an editor, I don't rewrite much since the content is for the entertainment of me and my players not for general readers, and writing is not my job. I'm not getting paid to write up adventures I'm just doing it as a side portion of my hobby. I give this book 1/2 out of 4 stars. Don't waste your time. I made a similar but shorter comment on the general book thread with a link to this post.